When planted en masse spring-flowering bulbs make a valuable contribution to formal bedding displays. Try growing groups of early-flowering tulips in a bed which will be occupied by annuals later in the summer. As a general rule, the larger, showy varieties are better suited to a formal position in the garden. Bulbs such as dwarf daffodils, crocuses, snowdrops and winter aconites can transform a dull looking lawn into a wonderful display of colour. To achieve a natural look, throw bulbs up in the air and plant them exactly where they land in the grass. The aim is to make it look as though they have decided to grow there by themselves. Allow plants to die down after flowering before mowing over the lawn. Alternatively, plant bulbs in defined areas so that it's possible to mow the lawn around them. Bulbs are some of the easiest garden plants to grow, needing only a well-drained soil and some sunshine. As a general rule, plant bulbs two to three times their own depth and around two bulb widths apart. It's important to plant bulbs with its top facing upwards. If unsure, plant the bulb on its side. Replace the soil after planting, breaking down any large clumps and firm in gently, making sure there are no air spaces around the bulbs. Naturalise bulbs in lawns by taking a handful and dropping from waist height. Plant where they land with a strong trowel or bulb planter - these are ideal for digging into heavy clay soil. To use, push the cylindrical blade down, twist and pull up a plug of soil. Drop the bulb in, flattest side down, and crumble the plug into the hole. In order to save time, try planting a large number of small bulbs by lifting a piece of turf and planting a group of bulbs in the soil. If you are using a clay pot with a large drainage hole in the base, cover it with a piece of broken pot. Fill pots with general-purpose compost, mixed with a handful of horticultural grit to improve drainage. To achieve maximum results for many years to come, Daffodils should be planted early and sufficiently deep; 12cm (5") of soil on top of the bulbs in light well drained areas, 10cm (4") in soil of a heavy nature. They are best planted where they can be left undisturbed and in those places a distance of 15cm (6") should be allowed between the bulbs. Daffodils benefit from feeding after flowering. The reason that daffodils go blind is, in the majority of cases, shallow planting and poor quality bulbs.Plant the bulbs as soon as possible upon arrival; if this is not possible, store in a cool place and open bags to allow some ventilation. After flowering in the Spring, remove the faded flowers and let the foliage die down (this usually takes at least six weeks). Daffodils benefit from regular feeding with a liquid fertiliser after flowering until the plants die down, at intervals of 7-10 days. If your daffodils are grown in the lawn, mow round them and do not cut down until at least 6 weeks after flowering. Daffodils make an excellent investment as they are ideal for naturalising in the garden. They are best planted where they can be left undisturbed, when allowed to establish themselves they will afford much pleasure for many years. Daffodils look superb in pots and containers on the patio. They should be planted in deep tubs or bowls as soon as possible upon receipt and positioned outside in the garden in a cool spot. Never allow the soil to dry out and ensure regular watering during prolonged dry periods, even in the middle of Winter. Hyacinths can be grown to perfection without any difficulty provided some basic rules are followed. The first essential is to develop a good root system as this has to support the plant throughout its life. This is achieved by a cool temperature and even moisture in the early stages after planting. Plant Hyacinths in the Autumn in a well cultivated, well drained soil. They should be placed about 10cm (4") deep and 5-8cm (2-3") apart. As the Hyacinths emerge in the Spring some varieties may require staking to prevent the from flopping over in heavy rain. The stake should be inserted along the stem and pierced straight into the bulb. Tie to the stem just below the flower head. Hyacinths do equally well planted in pots and containers but it is essential to plant the bulbs in good quality soil. Choose a sunny spot but remember it is essential during dry periods in the growing season that they are sufficiently watered. If not the results will be stunted and shrivelled flower heads. Hyacinths can be 'forced' for wonderfully fragrant Christmas gifts or simply to brighten up your own home! Start by placing a layer of damp compost into your chosen container  there is no need to add any fertiliser. Set the hyacinth bulbs on the compost, close together but not touching each other or the sides of the container. Fill around the bulbs with more compost, leaving space between the container rim and compost surface to allow for watering. The top of the bulbs should just show at the compost surface. After this, indoor hyacinth bulbs need a cold dark period, preferably around 9°C, in a shed, garage or cellar for up to 10 weeks. Cover the pots with black bin liners to stop light getting through and check them regularly, watering them sparingly if the compost feels dry. Once shoots have appeared a few inches above the compost surface, bring them indoors and place in a bright, cool position, taking care not to place them above a radiator. Water regularly when the compost dries out and they should start flowering within 3 weeks. Plant in humus rich but well drained soil 4cm (2") deep and 5cm (2") apart and it will spread rapidly. These ornamental garlics will thrive anywhere and live forever. Their richly coloured ornamental blooms, in a wide diversity of shapes and heights, are lovely in borders and excellent for naturalising in grass and woodlands. They are also very popular in pots and containers and in floral arrangements because of their lasting qualities. They appear anytime from late Spring to early Summer. They should be left undisturbed from one year to another and it is not uncommon for seedlings to appear naturally. 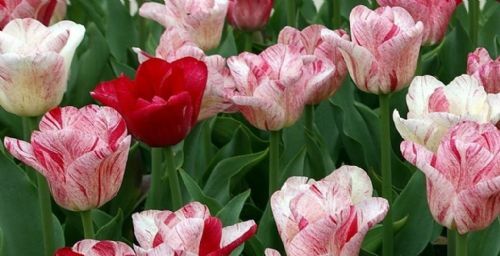 See individual varieties for depth of planting. The blanda types and the species are very useful for planting in the rockery or drifts in the border and underplanting deciduous trees and shrubs. While the coronaria are more suited to the border. The latter are also ideal for floral decoration but pick whilst in bud. Flowering time March to April. The blanda and species varieties need a moderately fertile soil and prefer a site in dappled shade. Plant 5cm (2") deep and 7cm (3") apart. It is beneficial to soak the bulbs overnight before planting. where they will produce large strong stemmed flowers. Plant 7cm (3") deep and 10cm (4") apart. Glory of the Snow. One of the earliest flowering bulbous plants that will grow almost anywhere. They are particularly lovely when planted in the Rock Garden or a wooded area, flowering from early March. Grows in any well drained soil and once established they multiply rapidly and seed freely. Plant 5cm (2") deep and 5cm (2") apart. Large crocus like flowers emerge in Autumn before the bold shiny green leaves which make effective foliage in the Spring. Established clumps planted in the neighbourhood of trees or shrubs look extremely attractive. Plant 10cm (4") deep and 25cm (10") apart in well dug soil. Only when clumps become congested should they be lifted and replanted immediately after the foliage has died down. Crocus will thrive in good ordinary garden soil. If left undisturbed they increase readily from self sown seed as well as the natural increase of the bulbs. The flowering season is from Autumn to Spring. We regret orders for Autumn Flowering Crocus cannot be accepted after 15th September. Grown from selected stocks the large flowering crocus produce an abundance of very large flowers. They are particularly suitable for naturalising in grass and woodland where their larger size gives them the advantage over the winter flowering varieties. However the winter flowering crocus are particularly suitable for the rock garden or small containers and will naturalise if left undisturbed. If necessary water the soil the night before planting. Plant in good garden soil 5cm (2") deep and 7cm (3") apart. Generally these species and meleagris hybrids are natives of damp meadows and woodlands and do well in borders. They are easily grown in pots but are invaluable for naturalising in grass. Fritillaria meleagris will seed themselves freely once established. Flower from April onwards. There are several different Iris types which makes them extremely versatile. The lovely Dwarf Iris are among the earliest of the Spring bulbs and provide the richest colours. The Dutch Iris will thrive under almost any condition and commence flowering in June, often produce secondary blooms prolonging the flowering period. The Spanish Iris are very similar but of a slightly smaller habit and a little later in flowering. The Dwarf Iris are particularly suitable for the rockery or pots and small containers. Whereas the Dutch, Spanish and Herbaceous type feel more at home in the border. Dwarf Iris - Planted in a semi shaded position they will last a considerable time. Plant 5cm (2") deep in well drained soil. Flowers February to March. Dutch & Spanish Iris - Will thrive under almost any condition. Plant 10cm (4") deep and 15cm (6') apart. They make excellent cut flowers. Herbaceous Iris - Plant in semi shade in well drained soil with the rhizomes just below ground level. hese gems will grow anywhere and will naturalise freely. Extremely versatile, they are superb for large bedding schemes, pockets in the border, woodlands, rockeries or simply planted in pots or containers. They will thrive in any type of soil with reasonable drainage so plant 8cm (3") deep and 7cm (3") apart. This is a charming plant that bears a dozen or more bells on a spike. It is extremely free flowering producing a carpet of blossom once established. Extremely versatile, it can be planted in borders, woodland, rock gardens or in pots. Flowers March to April. Thrives in any well drained soil. Plant 5cm (2") deep. These pretty little plant are so neat in habit and floriferous that they well deserves the most extensive culture. Small clumps of Scilla are much admired in borders, and rockeries. They will also thrive well under trees and shrubs and increase and multiply rapidly from self sown seed. They commence flowering in April. No flowers are more welcome than the lovely snowdrops (Galanthus). Left untouched they increase rapidly forming large clumps. The leucojum are well known plants resembling the snowdrop but are much larger and later flowering. ​​​​​​​Plant Galanthus immediately on receipt 5cm (2") deep and 7cm (3") apart. When clumps become congested they should be divided in March after flowering while the leaves are still green. Bluebells flower from late April to May, filling our woods with their incredible flowers and fragrance and providing nectar for moths, bees and butterflies. Plant at least twice the depth of the bulb, 15cm (6in) deep and 15cm (6in) apart, with the pointed up upwards. Bluebells should be planted as deeply as possible, 4 ins being the minimum, and more if possible. In nature they are often found over a foot beneath the surface of the soil!